What happened to my tile's paint? I do live in the middle of AZ in a desert, so our current theory is that this is the result of heat damage. But I don't know what I'm going to do with the Dragon Tile set, as I happened to like that one a little bit more. First, I want you to know that you do not need to worry, this is perfectly normal. Second, I want to congratulate you. Do you know what Adelheid (adh) is? Every mahjong player has a definite level of adh in them, and it's how you measure their strength at mahjong. It takes years of tough training and dedication to increase your levels of adh to a point where it becomes apparent. 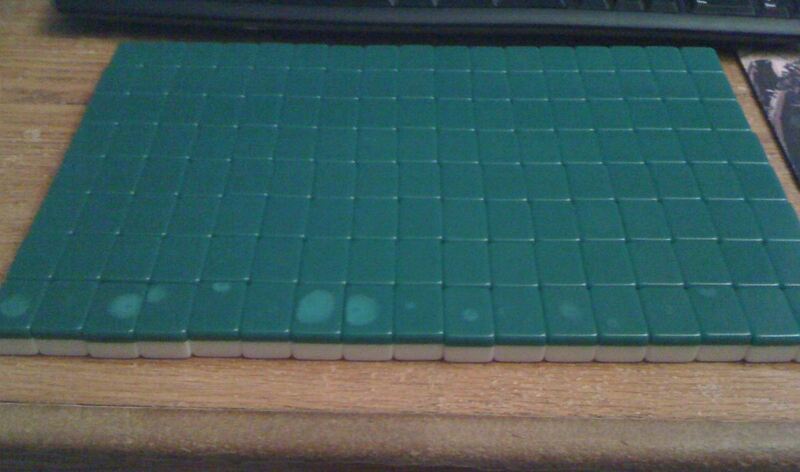 Your tiles are just responding to the massive amount of mahjong energy that is emanating from yourself. I would say by the damage on the tiles, that you rose to about 500 adh. That's a really high number for a non-Japanese, and especially for a non-politician. Some people are just born this talented, so I salute you. You should keep training to get at least 1000 adh and begin attempting your first gomoupai. Now, you should be really careful, as people with lower levels of adh will suffer physical damage when they play against you. Right now you're only at 500, so they will only experience a headache, but as you rise in level they may suffer from more severe damage such as inner hemorrhage. Last edited by xKime on Thu May 10, 2012 1:11 pm, edited 3 times in total. Or you should follow Barticle's suggestion, and get a set of depleted uranium tiles. That would work in the short term, but once your Adelheid count is over 9000 even those become vulnerable! I did find Kime's response very funny but you do have my sympathy. 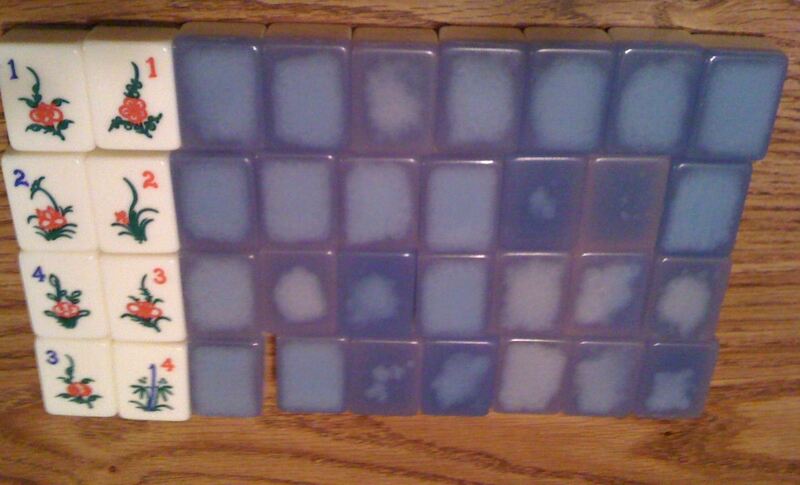 A mahjong set is a precious (and often quite expensive) thing and it's not nice when it gets messed up, especially if it makes it effectively unusable. I'd assume that the cause of the discolouration would depend on whether the tiles are made from two parts bonded together (in which case it could be a reaction in the adhesive or between two different materials) or a single piece with the backs painted (where the colouring might've reacted over time, possibly with residue left by natural skin oils). Judging by the appearance I'd guess the former, but this is all speculation. I have a vintage set with bamboo backs where there are dark marks at the ends of some tiles, presumably where glue has seeped out along the "grain" over time (prior to my purchase). I'd always be wary of prolonged exposure to heat, cold, light, damp and maybe even dryness. It's a radical suggestion, but I wonder if continued exposure to the same (or worse) conditions might cause the effect to eventually spread until all the tiles are equally and evenly discoloured...?! Barticle wrote: It's a radical suggestion, but I wonder if continued exposure to the same (or worse) conditions might cause the effect to eventually spread until all the tiles are equally and evenly discoloured...?! Practical men like you have improved this world. I'm not surprised, but I'm impressed. Funny you mention that. 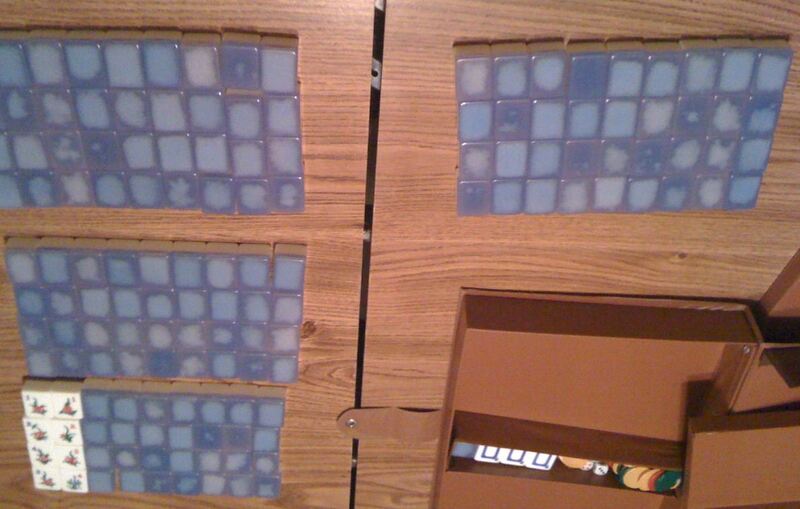 For the last three days, I've been running experiments on three different tiles. Grease group = Considering it might have been acidic damage from food or finger prints, I prepared a meal of incredibly greasy finger food, ate, didn't wash my hands, then I just rubbed the back of the tiles. Results? Not a darn thing. It's only been three days though, but the tiles haven't even exhibited a slight change in backing. WHY bamboo tiles?! WHY? I must congratulate you for using a control group. Always use a control group.